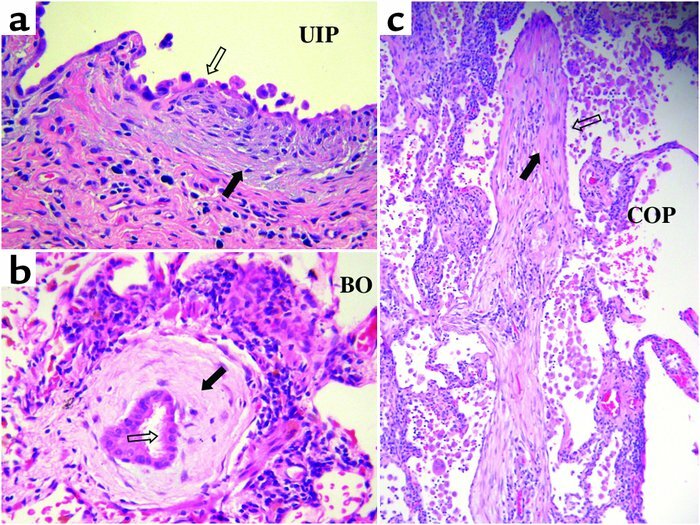 Photomicrographs of active matrix remodeling in: (a) UIP, (b) BO, and (c) COP. Filled arrows point to areas of active matrix remodeling in each disorder. Open arrows point to airway or alveolar epithelial cells overlying the remodeling matrix. Images were kindly provided by Kirk Jones, Department of Pathology, University of California, San Francisco, San Francisco, California, USA. Magnifications: (a, b) ×400; (c) ×100.